The Cascade Cow Moose hanging out around Route 73, outside of the Village of Lake Placid is causing quite a ruckus. I took today's featured photo on my way home from the real estate office the other day. Motorists like me are actually creating a hazard by stopping in and along the 55-mile-per-hour highway in order to take pictures of this nonchalant beauty. Clearly, the moose are doing very well in their Adirondack come back efforts. It seems like it was just yesterday when Vinnie the Vermont Moose swam across Lake Champlain and got things going in the Adirondacks. 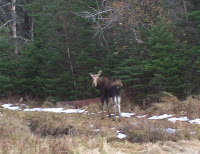 If you think seeing moose on your way home from work or play is interesting and are interested in purchasing property or a business in the Adirondacks, please feel free to contact me. Our market is doing pretty well, especially the second home segment. I have personally been extremely busy, as evidenced by my neglect to my blogging indulgence. Our limited inventory, due to the immense amount of publicly owned land, creates an element of market stability. Here is a short overview of Adirondack Property Value concepts. I will be updating my website with some cool new listings, so stay tuned!